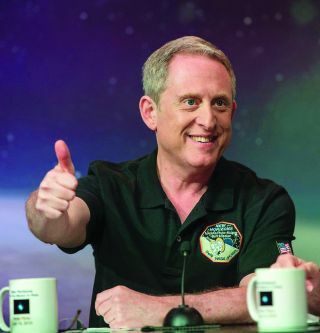 Alan Stern, the principal investigator of NASA's New Horizons Pluto mission. The accolades keep rolling in for NASA's New Horizons mission, which performed history's first-ever flyby of Pluto this past July. The American Astronautical Society (AAS) has given New Horizons principal investigator Alan Stern the 2016 Carl Sagan Memorial Award, which recognizes people who have made outstanding contributions to the field of space exploration. The award is named for famed astronomer and science communicator Carl Sagan, who died in 1996. "I am honored to receive this," Stern, who's based at the Southwest Research Institute (SwRI) in Boulder, Colorado, said in a statement. "And I’m accepting it on behalf of the entire New Horizons team across the U.S."
The AAS also recently presented its 2015 Neil Armstrong Space Flight Achievement Award to the New Horizons team, and the mission earned the top spot in numerous "Best of 2015" lists, including those compiled by Discover Magazine, Science News and Space.com. "We are honored that Alan and the entire New Horizons team have been recognized for advancing our understanding of Pluto and our solar system," Jim Burch, vice president of SwRI’s Space Science and Engineering Division, said in the same statement. Stern has been the driving force behind New Horizons since its inception as a concept 25 years ago. The $720 million mission launched in January 2006 and reached the Pluto system on July 14, 2015, zooming within 7,800 miles (12,550 kilometers) of the dwaf planet's surface. New Horizons' images and measurements have lifted the veil on Pluto, which had remained largely mysterious since its 1930 discovery. The spacecraft observed tall water-ice mountains on Pluto, flowing glaciers of water ice and a large swathe of crater-free terrain, showing that the dwarf planet was geologically active in the recent past. New Horizons is still beaming data home from the flyby, and will continue to do so through this summer, mission team members have said. The spacecraft is currently zooming toward a small object 1 billion miles (1.6 billion km) beyond Pluto called 2014 MU69; New Horizons will observe this body up close on Jan. 1, 2019, if NASA approves and funds a proposed extended mission.